Hot water has such an importance in our everyday lives. You would especially realize that if you somehow didn’t have hot water access. Though now we all need that hot water fast, in fact we need it immediately and this is where having an instant hot water system is a god send. There are lots of different systems out there each with their pros and cons. I have been lucky enough to have used a selection of different options to find the best one out there. Below are the best 3 options I have used. This water system is deemed the best all rounder, this is mainly because of the quality and general functionality of the product along with being very reasonably priced – it makes for a nice combination, let me explain why. First off as you may have noticed from the picture is the tap it comes with. This tap is a small tap which will be used to deliver your hot water and is about one third of the size of a regular tap for reference. So it must be noted that is does not replace your regular tap. It will deliver water temperature 160F(celcius) to 210F which basically means almost boiling water. As for the time it takes to deliver the water, it isn’t quite instant but it only takes a handful of seconds (3-5 seconds). It is a tank system which hold ⅔ gallons of water which is plenty of all general uses that you will need. As this is a self installation unit some people will be wearisome that is may be difficult to install though that couldn’t be more wrong. The installation was simple and only took me about 45 minutes and I was taking my time with it. It’s also worth mentioning that the actual tap itself is fine quality and looks really premium and feels solid and well put together. The great thing I really like about this unit is that is returns itself to off automatically once you are finished using it and this will save you a lot of energy and hassle in the long run. 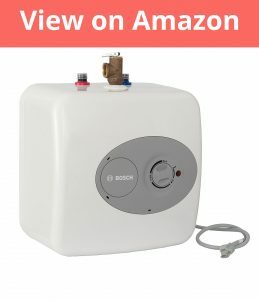 There are a lot of different electric water heaters on the market but this one from Bosch was one of my personal favorites and it also happens to be one of the most affordable options out there. Basically how it works is it has a small tank where the water is heated, you can get this tank in different size options to best suit you. There is a 2.5 gallon option, a 4 gallon and a 7 gallon option. I think the 4 gallon should be the best option for most people. You will need to decide based on what you like and the space you have available under your sink. As that is where it typically will be installed for example. It can be mounted on a self or wall so finding a space or place to mount it should be simple enough. The water temperature can be adjusted as you like with temperature ranging from 65F to 145F. The great thing is the hot water really is instant – it only take about 2 seconds for the hot water to start flowing and will a 4 gallon tank will run for slightly more than 4 minutes before the tank runs out of water. I imagine that should be enough for most common uses. In terms of installation this was one of the easiest options I used. It runs off a regular electric plug and there are 2 standard hoses which pretty much every sink has. It’s worth mentioning that you may need an adapter though if you are using a newer sink though I personally didn’t. 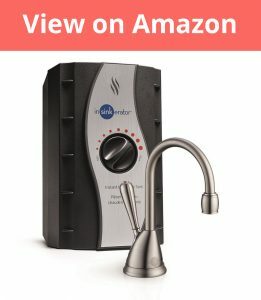 This is a great overall option that does exactly what you want from a hot water system and all at an affordable price – it’s an easy recommendation for me to make. If you are looking for a high quality option that has an included tap this could be the best option for you. As you can see this hot water system comes with an included satin nickel tap. The tank itself is also made from stainless steel which is a nice quality choice as well. The tap itself is much smaller than your standard tap at about ⅓ of the size. Though it is well made and functions well in terms of turning on and off though I would’ve liked a little more movement on the tap itself from left to right. The unit itself can be fitted fitted under the sink or wherever you prefer. If you choose to have it exposed it is one of the more premium style units and it wouldn’t make the kitchen look tacky or anything else. In terms of the installation all the components are high quality and I was satisfied with them. Though the instructions for installation where a little confusing and caused me some problems. If you don’t mind the expense hiring a professional to install this may be something worth considering. The functionality works flawlessly – you have immediate hot water whenever you need it and that’s the best part! 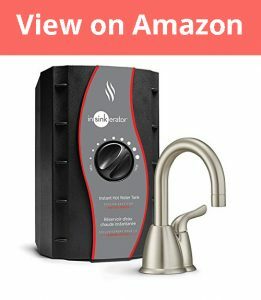 Overall the functionality and the premium parts make this the best instant water heater out there, also coming with a nickel tap, though installation isn’t easy so hiring a professional may be a good choice.